Dealing with difficult parents is a part of the job that Teacher Ed classes don’t cover. Talk about experiential learning! 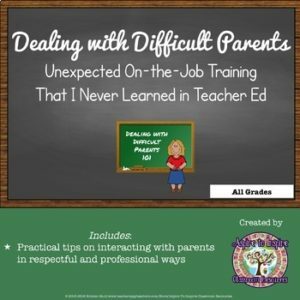 This short document includes tips on interacting with parents in professional and respectful ways based on (sometimes painful) lessons learned by an experienced teacher. A helpful resource on parent communication for first-year teachers and any teacher who wants to know he or she is not alone in facing these uncomfortable situations! Document your parent communication with this easy-to-use Parent Meeting and Conference Documentation Form.